We’re so thankful that God has led you to pursue a calling in healthcare here in Philadelphia. Whether you’re just arriving, staying, or leaving, we want to extend a warm welcome to you and let you know we’re here to help you in your calling. Each healthcare campus has its own Christian fellowship. Rather than leading those fellowships ourselves, we’re here to come alongside them as they carry out God’s calling. At this time, campus fellowships exist at the following schools: Arcadia, Drexel, Jefferson, PCOM, Penn, Temple Dental, Temple Medical, Temple Podiatry, and University of the Sciences. If you don’t see your school/program here, contact us and we’ll help you start one or connect with another ministry. Since each campus – and each year – is so different, much of what we do is specific to whatever God is doing, wherever you are. In that context, our ministry team is here to provide personal mentoring and discipleship, help leaders develop and carry out a campus-specific vision for ministry, and, to connect students to resources that will help them carry out this vision. Fall student retreat – this fall (Oct. 10-12), we are holding our annual student overnight retreat! This is a fantastic opportunity for our campus fellowships to get away with each other to be refreshed, and, especially, to build relationships that will strengthen their groups for the rest of the year. Healthcare bible study brunch – every 3 weeks, our area director and his wife offer a bible study brunch for healthcare students at their home. This is a great opportunity to connect with other healthcare students from all over the area for bible study and a home-cooked meal. For the winter-spring 2014 semester, our topic will be ‘sharing your everday faith every day’. We’ll be using the book Get Real and hosting practicing professionals to help us learn what this can look like in ‘real life’. 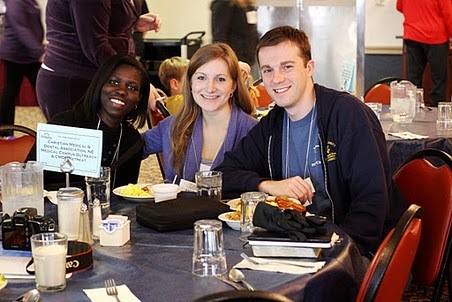 Intermed – twice annual gatherings of healthcare students and professionals for fellowship, food, teaching and worship. We coordinate the fall event, while MCO coordinates Intermed in the spring. Integrating faith & medicine – Coming in 2014-15! Talking with patients about their spiritual concerns is so important, but also so intimidating. Our re-designed Grace Prescriptions materials will teach you how to share your faith in real-life clinical settings. Even better, the principles apply to all relationships, not just those in healthcare. As more information becomes available, we’ll let you know. Seminars – Recently, we held a Community Life & Relationships Seminar to place male-female relationships in the larger context of how God designed us for a relationship with Him and those around us. You can obtain notes and audio recordings of those sessions here. Next year, we hope to consider the issue of being faithful stewards of our finances. Stay tuned! Again, we’re here to help you and your campus fellowship however we can. If you have a new idea or ministry that you’d like to pursue, we’d love to hear about it! Let us know how we can serve you by connecting with us. Thank you, Chauncey, very kind of you. This is a free WordPress theme that I have customized. Best wishes to you.